If your staff are able to clock-in on the Time Clock but the information is not being sent through to their Timesheet, your Time Clock is most likely Offline. If the Wi-Fi logo is displayed, your device is connected however the network may be experiencing issues connecting to the Internet. Check that other devices (computers, mobile phones etc) connected to the Wi-Fi are working, if they are then the clock-ins will be sent through to Tanda once a connection is regained. If the Internet is not working, then you will need to fix this issue. If your Wi-Fi connection is only showing 1 or 2 bars, then try moving the Time Clock to another location where the connection may be stronger. If your Time Clock has still not sent through the clock-ins, move to the next troubleshooting step; checking for an App Update. If it does not reappear, you may need to try to reconnect your Wi-Fi network. To do this, swipe down in the top right hand corner to bring up the Settings menu and click the cog icon in the top right hand corner. Under the “Connection” tab in the top of the screen, click “Wifi” under the “Network Connection” panel on the side. Select your Wi-Fi network from the list and enter your password. Hit the home button at the bottom of the device to return to the Tanda App. If it does not reappear, you may need to try to reconnect your Wi-Fi network. To do this, go to your Settings and select Wi-Fi, choose the relevant Network and then re-enter your password. Hit the home button at the bottom of the device and return to the Tanda App. Just click OK to the warning message that pops up. Count to 10 and then repeat by holding down the power button until the menu pops up and click Airplane/Flight mode again. 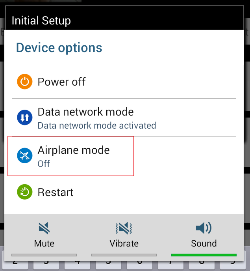 Click OK to the message that Airplane/Flight mode will be turned off. If your Time Clock is still Offline, next let's check to see there isn't a warning that the App needs updating. Tanda regularly make updates to improve the reliability of the Time Clock. The Time Clock will generally still function as always without the update, but you should enable the update as soon as possible. The final step is to restart your device. Like any piece of hardware, sometimes it just needs a reboot. For Samsung: Hold down the power button on the top right side of the device (above volume) until a menu pops up. Press the Restart button. The device will then power back up and open on the Time Clock. Wait a few minutes and check that the Offline warning has disappeared from the bottom and then check in Tanda that your clock-ins have come through. If your Time Clock is still not online at this point, you can try Force Stopping the app. For Samsung: scroll from the top down and select the Settings cog in the top right hand corner. On the left menu select Applications and on the right select Application Manager. 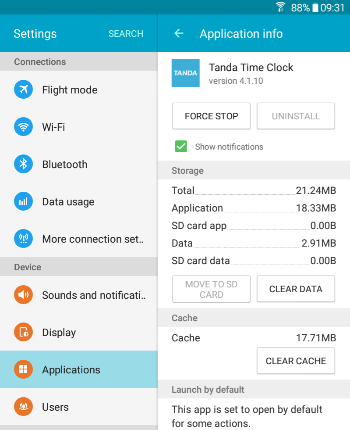 Scroll down until you see Tanda Time Clock and click on this and press FORCE STOP, click OK. Press the Home button at the bottom of the device and the Time Clock will restart. For iPad: double click the Home button to open your most recent apps. Swipe left or right until you see the Time Click and swipe up to close it. Then re-open the Time Clock app. If one of these troubleshooting solutions fixed your issue, your Time Clock should show up as Online again in the Dashboard and your pending clock-ins will start coming through. If not, please contact Tanda on the details below and let us know what you have tried.